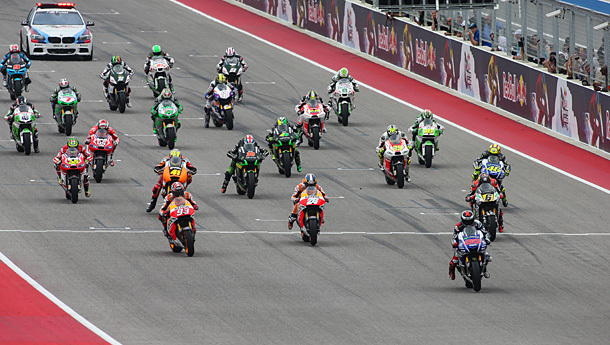 Marc Marquez completed the perfect weekend in Austin, having led every session, taken pole (with a new lap record), recorded a new fastest race lap, then crowned it with a victory at the Red Bull Grand Prix of the Americas. The Repsol Honda rider won by 4.124s from team-mate Dani Pedrosa, with Andrea Dovizioso (Ducati Team) completing the podium. 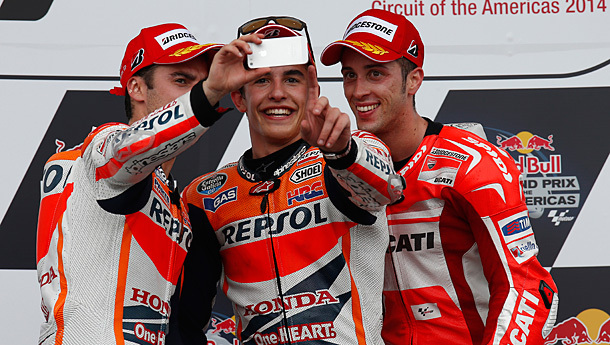 Facebook, Twitter or just the family album….L-R Dani Pedrosa, Marc Marquez and Andrea Dovizioso. Marquez had his best start in the premier class, only beaten in the first corner by Jorge Lorenzo (Movistar Yamaha MotoGP) who made an uncharacteristic jump start – forcing him into the pit lane for a drive through penalty – and promoting Marc back up to first by the end of the first lap. Pedrosa tried to stay with Marquez, who was the only ‘Factory’ rider to run the hard rear tyre, but the youngster sped away to become the first rider to win the first two races of the year from pole in the premier-class since Mick Doohan in 1995. 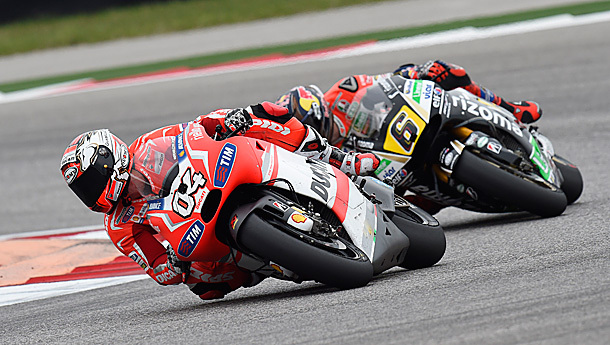 A first podium for Dovizioso as a Ducati Team rider was great news for the Italian factory, though there was some bad news for them too as Cal Crutchlow crashed out and injured his right hand, having earlier pitted due to tyre problems. Stefan Bradl (LCR Honda MotoGP) missed the podium by just under two seconds after winning a battle for fourth with Bradley Smith (Monster Yamaha Tech3), whilst Pol Espargaro (Monster Yamaha Tech3) was sixth. Andrea Iannone (Pramac Racing) dropped back to seventh having been third in the early stages, whilst there were problems too for Valentino Rossi (Movistar Yamaha MotoGP) as he hunted the podium in the early stages and faded to eighth in the second half of the race. Aleix Espargaro (NGM Forward Racing) was ninth at a track which he has admitted is not his strongest, whilst Lorenzo rounded out the top ten after his mistake at the start. Whoops! – Jump start by Jorge Lorenzo saw him take a ride through penalty. Nicky Hayden (Drive M7 Aspar) finished as the top ‘Open’ Honda rider and top American in 11th – whilst his compatriot Colin Edwards (NGM Forward Racing) was unable to finish his home race. Crashes for Alvaro Baustista and Scott Redding also ruined GO&FUN Honda Gresini’s weekend. 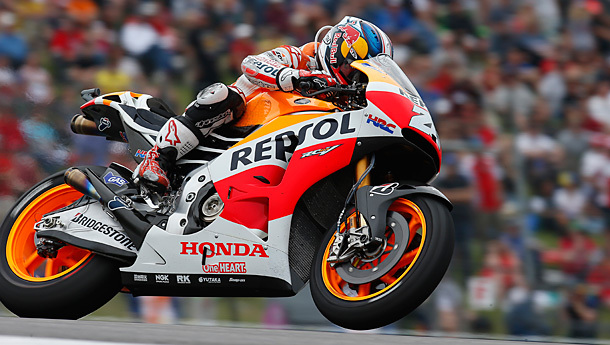 Honda riders have now won the last nine MotoGP races in the USA and the last non-Honda MotoGP winner in the States was Lorenzo, at Laguna Seca in 2010. A disappointing weekend for Broc Parkes (Paul Bird Motorsport) retired from the race early with tyre and mechanical problems. 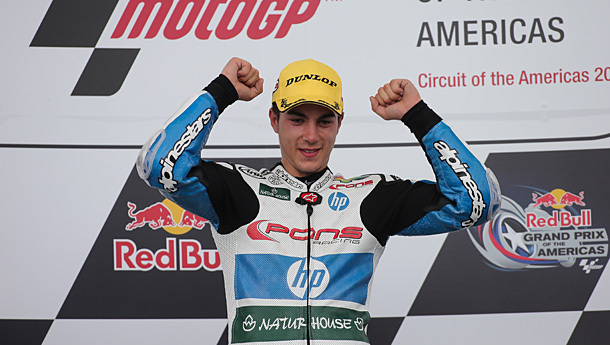 Maverick Viñales (Pons HP 40) took the honours in just his second appearance in the intermediate class, with Esteve Rabat (Marc VDS Racing Team) second and Dominique Aegerter (Technomag carXpert) third. Aegerter took the final podium spot a further three seconds back with Xavier Simeon (Federal Oil Gresini Moto2) crashing out of the rostrum hunt at the end of the penultimate lap having earlier led the race. Aussie Anthony West (QMMF Racing Team) had another top 10 finish. 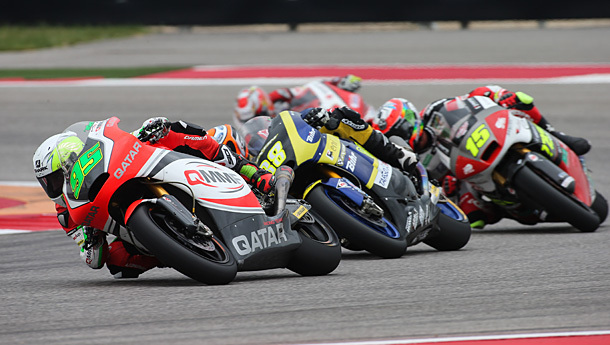 Anthony West finished seventh at the Grand Prix of the Americas. There was chaos at the first corner when the race got underway as a crash hindered the race of many riders, with Josh Herrin (AirAsia Caterham Moto Racing), Mattia Pasini (NGM Forward Racing), Axel Pons (AGR Team), Nico Terol (Mapfre Aspar Team Moto2), Sam Lowes (Speed Up) and Luis Salom (Pons HP 40) all involved. Of that group only Herrin, Terol and Salom were unable to finish the race and all riders were ok.